I won’t be posting here until the middle of August. We are going to England and Ireland. 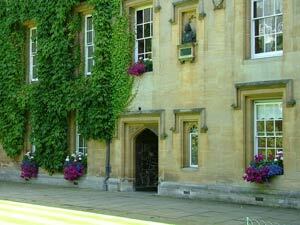 Kristin Steiner, my ever talented wife, is teaching for 6 days at Oxford Summer School. 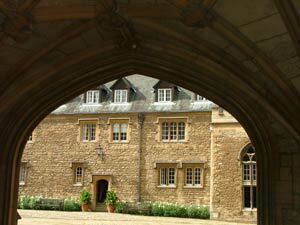 I’m tagging along, we’ll stay with friends in the Cotswolds afterward and then go to Ireland for 4 days. Kristi taught there last year and was invited back. It is a beautiful place, England. I am going to do what I haven’t done in a while and use technology – read e-mail, Internet, cell phones – at a minimum. In fact we won’t have a cell phone. 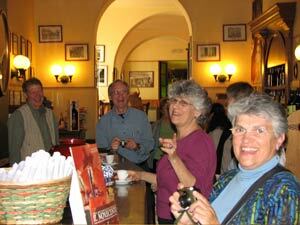 It is what we hope and encourage people to do on our small group tours to Italy. It’s the only way to really experience a place, to do slow travel, slow food. If we are constantly calling home, checking e-mail, we aren’t really there. It is a problem generally for people today, and we hope travel in Italy with us provides a respite, a chance to connect with life, to live bigger. the travel experience. I travel to Italy a lot, but mostly I am leading our educational travel tours. While I certainly get into Italy and Orvieto, I am still working. In England and Ireland I want to pay attention to being a visitor so I can bring that to our travel in Italy. I want to look at things through the eyes of a traveler. I don’t know that it will change how we do our trips, but it might. Drawing will be one of the things I do. I love to draw, have some talent, no training, and do it rarely. What I know about it is two things. One, you really, really remember a place you’ve drawn. When you see the drawing again you are instantly transported back to it, the time, the smells, sounds, how you felt. You don’t get that from a photograph, particularly with digital when you snap endlessly (technology again!) Two, when you draw you are absolutely present in the moment. You are paying attention in a way you typically do not. I took a lot of pictures last year. I am as addicted to technology as anyone. I’ll take more, but I do hope to balance it with drawing. So I am looking forward to our trip. Travel, of course, opens us up anyway. It is one reason to do it. So ciao for now. Last year I gave a talk to the annual meeting of the American Planning Association. This is a big meeting with 30 or so concurrent sessions. My topic was stewarding yourself. It had nothing to do with building skills, enhancing what you know – the typical reason you go to a conference. So I was expecting somewhere between 10 – 30 people. I had handouts for 50. I was stunned when over 100 people came to the session. It wasn’t because of me – none of them knew me. It was because they needed to steward themselves. They worked hard, were pressed for time, constantly under pressure. Yet most saw no alternative, felt they had to soldier on for a variety of reasons.The turnout speaks to the trouble we face as a people in today’s overwrought world. So often the people who travel to Italy with us express their need for self care, that this is what the trip is about for them. It isn’t selfish. Every one of us has unique talents, gifts, abilities. Only when we bring these to the world do we give it what is uniquely us – the only thing we have to give. Developing your talents and quieting yourself for a week to listen is what you do with us in Italy. The world deserves it! Carl Honore wrote “In Praise of Slowness” about 3-4 years ago. It is a wonderful read, lots of compelling reasons to slow down, and makes you wonder at how we live today. You can listen to a 20 minute video presentation of his (if you can’t slow down enough to read the book!) that captures part of what the book is about. Click here. Watching the video, or, even better, reading the book, you gain such an appreciation for the pace at which we live – and how insane it is. The last little while I have begun trying to spend time slowing down and not doing, or doing less. It doesn’t come naturally. We are raised to be productive, to get things done, to not waste time. Not doing takes some doing. The amazing thing I am finding, however, is how much more alive you become when you do. You are so much more aware of the world, it is brighter, sharper, more intense. It is truly amazing. I am getting over feeling guilty if I do nothing. It’s great! This is the second video I have recommended from TED. TED is a web site that has over 200 thought provoking videos. All are about 20 minutes – part of their challenge to thinkers: present it in 18 minutes! TED was introduced to me by my friend Ernie Denny. Ernie runs the Sculpture Program at Clemson University’s Botanical Garden. 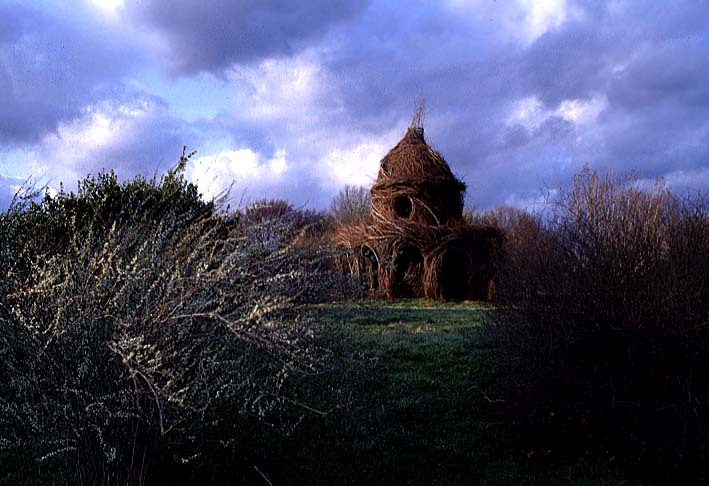 Artists create sculptures out of plant materials, which all eventually will melt back into the ground. The tag line is “where nature and culture” meet. It is really quite cool. 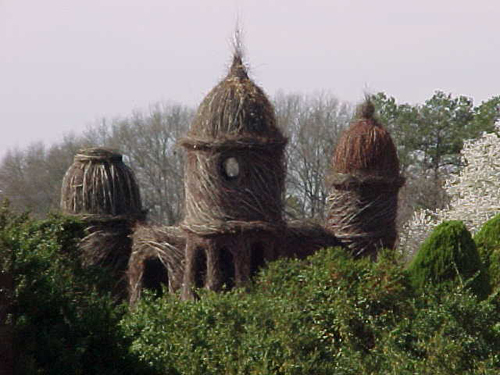 This is a sculpture from 2001, called Spittin Image by Patrick Dougherty. It’s made from woven red maple and dogwood saplings gathered from power lines and hiway right-of-ways. Ok. This gets better. Ernie tells me this sculpture was inspired by a piece of work by Italy’s Bramante. Since we do trips to Italy, this is serendipity for sure. Following are some comments and another moody picture of it from Ernie. — Mitchell Beazley. The World Atlas of Architecture. p276. — Marvin Trachtenberg and Isabelle Hyman. Architecture: from Prehistory to Post-Modernism. p302. I am sure the rest of the country gets tired of all the boomer talk. But I am one, so it is what I know, and what I talk about. I am convinced that as boomers retire they are going to get back to their roots. What might those roots be? In our formative years we were an idealistic group. We came through college determined to make change and create a better world. But then we began getting jobs, having kids, getting way too responsible. We were subsumed into society adopting the mores of all those around us. It is sad really. But I believe boomers are going to return to their idealism, work to make change and to finish what they began. Truly, what I love about what Kristi and I do is that we help people get in touch with their deeper selves. This is not just boomers, of course. But for boomers it allows them to reconnect to the people they have been suppressing since their idealistic youth. What we do is put people in a place and with activities that draw who they are, what they were born as, out. I can’t explain how Italy does this. We both remark how we are never so much ourselves as when we are there. The art work that people engage in on our trips is a wonderful way to observe and understand more deeply. It certainly complements what Italy does. There is little so satisfying as seeing people’s shoulders begin to drop during the week. See them prance around the streets. See them return with new discoveries as if they were a child again. And hear them say how they are going to go home and do things a little differently. We were full of life as young boomers. In Italy we come back to life. Soooooo great! I may be wrong, but I believe we are getting tired of working so much in the U.S. Sure we are a different culture, but the pace, the intensity, the nonstop nature of our work is wearing us out. Here are some interesting facts. We work 9 hours more a week today than in 1986. We work over one month’s more worth of time in a year than in 1970. 1 in 3 feels chronically overworked. 54% of us has felt overwhelmed in the last month by the amount of work we had to do. In 1960 we worked less than the Europeans, now it’s considerably more. If we worked the same number of hours as in Europe we would stop working on October 22 for the rest of the year. It is not that Europeans don’t like to work or aren’t productive. In fact, they are as productive as we on a per hour basis. The difference is that they are better at enjoying and relishing life. There are a lot of reasons for this, but the fact of the matter is that we have forgotten what it is like to live life, to work to live rather than the opposite. One of the reasons I left the normal work world three years ago was because I felt life was out of balance. Try as I might, I could not convince the powers that be of the benefits of a more flexible work schedule. Like nearly every workplace, people were manic about work. Life was too short to fight it. So I left. 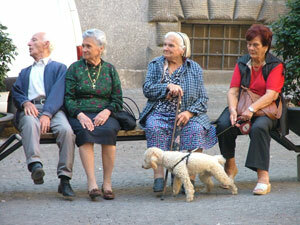 What I love about going to Italy for our trips is that we see people really enjoying life. And we enjoy it with them. Life is so good when you live it rather than work it. It took probably 5-6 years for me to get up the courage to leave a secure job to go out on my own. One of the steps along the way was several years when we spent a summer week in Maine. It was remote, completely in touch with nature, devoid of the franchise food, gas station, hotel and retail sameness of everywhere else in the country. It was, in short, authentic. The nature and authenticity encouraged finding the same in myself. Those weeks were instrumental in uncovering a desire for more. The more is now Italy and what I would characterize as an advance. 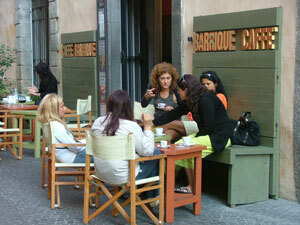 On our trips in Italy people are lit up, they rekindle the fire in their bellies. they stoke the stores upon which to call when they get home and it gets tough. Italy brings them alive, engages them deeply in life. 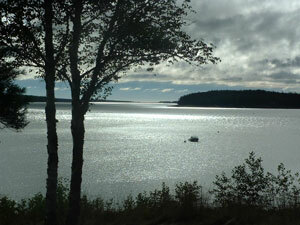 Where Maine was a retreat, Italy is an advance. Both are so needed in life today. Unfortunately we take too little time for either. It has been said the only way Americans really take time to slow down and think is when they are sick. That is sad! The May 2008 issue of Bon Appetit is the travel issue. In it Los Angeles chef Alex Palermo cooks up a meal in Orvieto using local ingredients. The food is served in a palazzo with great views of the cathedral. The menu includes white pizza with rosemary and sea salt, pasta with favas, peas with onions, and much more. Rome – think potato chips but so much better! We usually have a picnic or two, and using fresh ingredients from the market makes them such a delight. Eating fresh food is one of the eye openers of our trips. It is a subtle yet important way we “relearn” what it is to live fully. 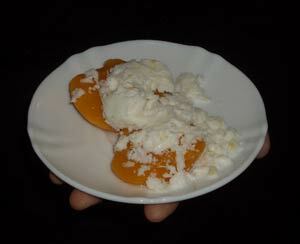 We have forgotten what the freshest of food tastes like, how amazingly good it is, how flavor bursts in your mouth. We have out of season produce all year long in the U.S., but not until we taste fresh to we know the price we pay. You’ll never want to eat a “vine ripened” cardboard American tomato again! !